I'm back again with bell sleeves, and I love it! I told you I wouldn't be giving them up. I'm especially loving how these sleeves are tiered adding a dramatic feel. 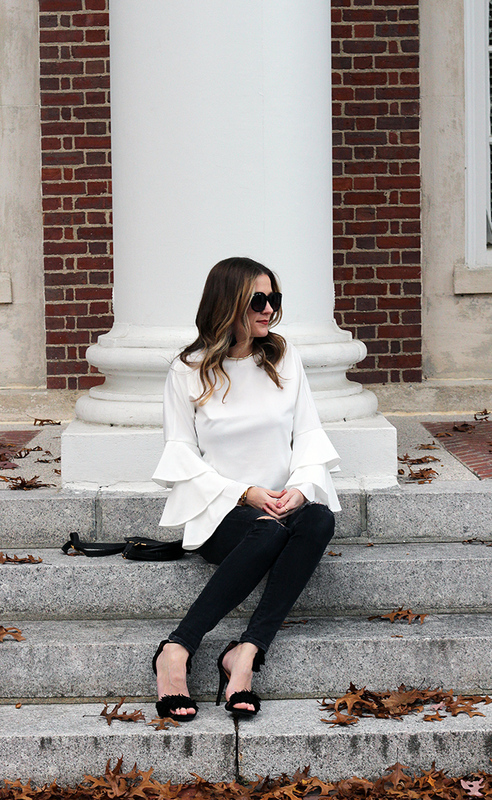 This tiered blouse is from Shein, and one of my favorite purchases from the online retailer yet. Oh yeah, it's on sale for less than $13! I'm still pinching myself at the price, because it definitely feels like a more expensive top. 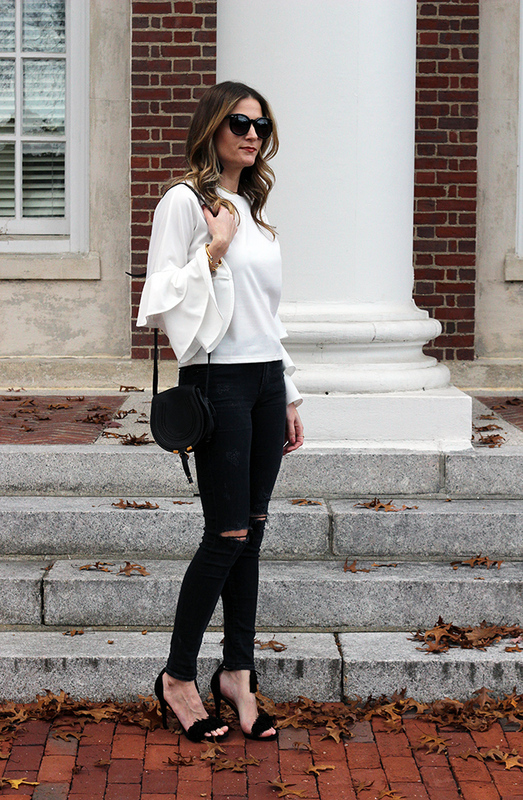 Because the sleeves add a good deal of drama, I kept the rest of my look simple by pairing it with my favorite black distressed jeans, which also happen to be on sale. Hurry though, because sizes are selling out fast! I finished my look with my fringe heels, and these fun tassel earrings by Bonita Pina. If you haven't heard of Bonita Pina, make sure to visit their site because I love the story behind the company, not to mention the beautiful selection of statement earrings and jewelry. They are also offering my readers 20% off by using the code: RACHAEL. I hope everyone has a great weekend. I'll be heading to the lake to finally meet my new niece! I don't think that I've mentioned it yet on the blog, but last week my sister had her baby. A little girl named Lillian Mavis (Mavis after our grandmother). I've been sick with a bad cough for the past week and a half, so I couldn't be around a newborn, and it's killing me that I haven't had that precious girl in my arms yet. Now that I finally feel better, I am beyond excited to go meet my little princess. We have two feature bloggers this week! Meagan of Meagan's Moda and Alyssa of She's Alyssa Renee. I'm in love with Meagan's burgundy look, and how gorgeous is Alyssa's red leather? Make sure to stop by their blogs and say hello! Love this top!!! Glad you are feeling better!! 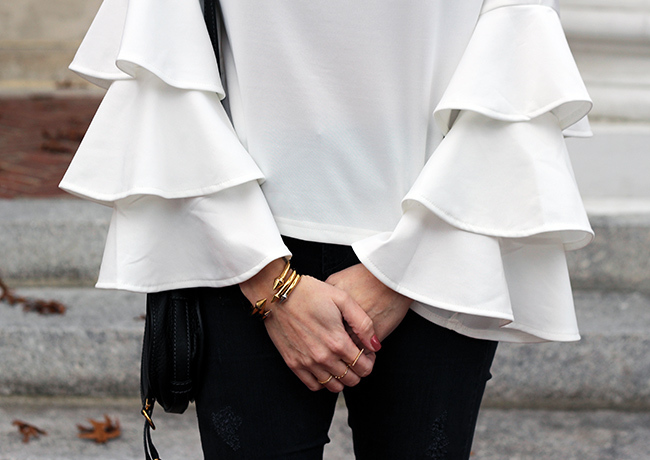 Love those sleeves paired with the black jeans. You've got great style. I'm following you now to get updates from your blog, I hope you would like to follow back. Thanks. Awesome outfit, absolutely loving this top! Well, hello there fall fashion model!! You know I'm pretty much obsessed with this top because of it's over-the-top look and feel....and what a steal too!! That's a really nice top! You look fabulous! Those tiered ruffle sleeves are so glamorous! And the black and white is so chic! I love your bell sleeve looks! I feel like if it works and looks good stick with it! Loving this black and white look! The bell sleeves are so fabulous! Rachael, I love this dramatic look! It is so striking and beautiful! Thanks for linking up with me On the Edge. These tiered sleeves are def. a statement! Just love this chic b/w look on you! Oh how I love those bell sleeves! So happy you finally get to meet your niece, I love her name!! This top!!! You're whole outfit is beautiful! Love this top, and the whole outfit! So chic! That blouse needs to come to my closet. I have mentioned before, I love how you almost always choose a pair of gorgeous dramatic earrings to dress up your outfits. Love this particular pair, I need more tassel earrings!